Recorded/performed at: City Recital Hall, Angel Place, Sydney, on Feb 09. Andrew Ford Ian Munro 59 mins, 16 sec. 1. Invocation I -- 2. Prelude -- 3. Ole, bole, bom... -- 4. An epic of disbelief -- 5. Waltz for Jasper -- 6. Midwinter waltz -- 7. Invocation II -- 8. Epiphany -- 9. Impact -- 10. Tuittu alone -- 11. Nyyti's journey -- 12. Mörkö -- 13. First glimpse -- 14. Life in a shell -- 15. Invocation III -- 16. Waltz for Cathy -- 17. Blue waltz -- 18. Lina's waltz -- 19. Dancing bear -- 20. Thunder and lightning waltz -- 21. Hammer and tongs waltz -- 22. Waltz toccata -- 23. Left hand waltz -- 24. Nightmare -- 25. Invocation IV -- 26. Waltz maze -- 27. Yellow Cab waltz -- 28. Valse de Schoenberg -- 29. Pig waltz -- 30. The fall of Icarus -- 31. It's dark in Helsinki -- 32. Mad March days -- 33. Second glimpse -- 34. Wallangunda waltz -- 35. Perpetual waltz -- 36. Waltzing alone -- 37. Invocation V -- 38. Waltz to put Leonardo to sleep -- 39. Whole world waltz -- 40. Verdens-valsen -- 41. Waltzer für die ganze Welt -- 42. Koko maailman valssi -- 43. El vals del mundo entero -- 44. Invocation VI -- 45. Peggy's waltz -- 46. Wistful waltz -- 47. A waltz more wistful yet -- 48. Midwinter (again) -- 49. Aubade -- 50. Waltz for Alice -- 51. Monsieur Satie scratches his head -- 52. Aada Liina's dream -- 53. Statue waltz -- 54. Skitter waltz -- 55. Invocation VII -- 56. Mirror waltz -- 57. The Swan Street waltz -- 58. Anni's waltz -- 59. A ruined waltz for Ross Bolleter -- 60. The last waltz. Liner notes include program notes, and biographical notes on composer and performer. 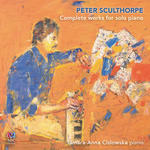 Includes bonus data CD containing interview with Andrew Ford and PDFs of 10 waltzes. 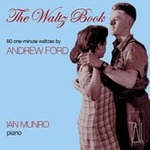 Score: The waltz book / Andrew Ford.